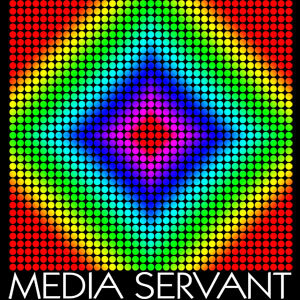 Media Servers and Digital Lighting was a quick introduction to “convergence” and the technologies involved in using digital media for stage lighting. Current lighting trends include the use of arrays of fixtures such as RGB LED units to replay images and effects, using Pixel Mapping. This article looks at the basics of pixel mapping and asks if it is possible to re create some of these effects on a budget. What is Pixel Mapping, exactly? Pixel Mapping (in the World of Lampie) is the use of software to map and replay media such as bitmaps or video on an array (AKA grid or raster) of lighting fixtures. 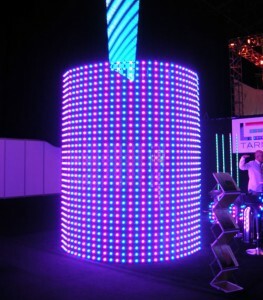 The fixtures could be anything; moving spots, PAR cans, Birdies but the use of colour mixing LED kit (inc Pixeline, Versa Tube or Color Web) is a common and appealing technique. You effectively get a low resolution screen to display your goodies, made from “pixels” of red, green and blue LEDs. In this article, we will refer back to the RGB LED model as it’s easy to understand. Displaying the image on the screen is the job of the pixel mapper. Professional lighting media servers have mapping functions, pixel mapping software (like PixelDrive or the Arkaos Pixel Mapper) is available to run on a laptop and some lighting consoles can cope with a degree of mapping all on their own. How does pixel mapping work? The pixel mapper treats each fixture as an individual pixel and sends the correct information (usually colour and intensity) to the array. Lighting fixtures are still commonly controlled using different implementations of DMX. With our LED “pixels” using up at least 3 DMX channels, you can see how even a small surface can use up hundreds of DMX addresses. Some control systems and media servers have their own proprietory network protocol to talk to each other, but talking to the fixtures themselves requires a standardised approach. Currently, the most common control signals are sent using ARTNet, the open source protocol for sending mulitple DMX universes. This can be split down at the surface or go straight into a proprietory control box for the LED sytem. Pixel mapping is only an tool. It lets you create certain complex effects the easy way – with pre-made or live rendered digital media. It certainly beats programming a 1000 step chase of complex RGB levels. It doesn’t have to be a full colour “screen” of LEDs. There is no reason why you can’t send the output to dimmers connected to a grid of PARS. What information does a pixel mapper need? Take the simplest system – a 3 x 3 grid of PARs (yes, you can’t display hi res video on this but it’s a good starting point). The pixel mapper needs to know that your array or grid is 3 pixels by 3 pixels – 9 PARs in a square. The system also needs to know that PAR 1 (DMX dimmer A/001 for example) is top left and that the number runs from Left to Right, Top to Bottom. This means when media pixel 1 is ON, the correct PAR (Top Left) fades up. So, the pixel mapper needs to know the number of fixtures and the shape of the surface plus the positioning (ie. DMX addresses) of the fixtures. Media server pixel mapping software can have the fixture personalities of particular instruments to help with the DMX channels. The personalities are handy for the quick set up of large arrays using common fixtures can can be broken down into pixels. In our examples, we’ll just think in terms of a few simple RGB elements. Many products and layouts have a set pixel “pitch”. This is the distance between each pixel, vertically and horizontally, and is important when mapping onto surfaces where the pixels/fixtures aren’t jammed up tight together. Mapping a screen image onto a surface with a wide pitch, the image ends up stretched all over. Digital media usually has a 1:1 pixel pitch ( the horizontal pitch is the same as the vertical). If your fixtures were 300mm apart sideways but 1m up/down from each other, the resulting image is stretched and squashed all over the place. Distortion of media might be a nice effect but only if you intended it to happen. The suitability of content for pixel mapping depends on the arrays they will be replayed on. A really low resolution grid like our 9 PARs isn’t going to look much with an XGA full colour image across it. Although it is not always necessary to create media content at exactly the right resolution, understanding how the images will actually look is important. Great effects can be created with a low resolution array and some carefully chosen higher res media but think of the result of 16 million colours on those 9 PAR Cans. A bit of a dimmy, flashy mess. We bet that you want ways to experiment with pixel mapping without going the expense of full on media servers or Grand MA’s. Quite a few cheap lighting control software has some form of pixel mapping function including the OSL favourite – Cham Sys MagicQ PC . The onboard array control on the Cham Sys is similar in nature to the system on the Grand MA – creation of grids, applying fixtures and mapping images, text and other effects to them. There is a range of options for pixel mapping. As noted above, most professional stage lighting consoles have a certain level of pixel mapping capability including desks such as the Grand MA, Avolites, ETC EOS etc. Readers of On Stage Lighting will know that I’m a particular fan of the Cham Sys MagicQ for many reasons and the desk’s pixel mapping capability is no exception. Madrix One of the key players in LED lighting control for installed systems. LightJams An innovative lighting control software that is ideal for creative use of pixel grids. Resolume Arena A VJ/Media Server that can also output DMX and ArtNet to a grid. Pro media servers such as Hippotizer have plug-ins that extend the core software capabilities to include pixel mapping. The Cham Sys MagicQ has had pixel mapping features for quite a while (as usual, Cham Sys got there early and other desk makers have since caught up). The mapping on the MagicQ is simple to set up, creating an Output Grid (as in this tutorial on the MagicQ) and inserting RGB LEDs or whatever into the grid to create the ‘raster’ (the pixelated array). Large pixel offsets or gaps can be handled by skipping slots on the grid, which can be a little clunky in certain situations. A ready-made fixture personality for PIXMAP is then patched, creating a single fixture for the grid to apply the mapping to. The MagicQ includes built in grid effects but you can also store media files on the desk itself that than then be applied to the grid without the use of another media server. The MagicQ also has the facility to preview the resulting output in a window and in the built-in visualiser Magic Vis, so you can see the result. What other cheap pixel mapping options are there? “.Matrix is stable in my experience, and none of my users have reported any problems with it. Landy also said that he has currently put extra features on hold ( more I/O devices like the Enttec Pro USB DMX) but had hinted that if enough people are interested, he would continue working on the software. The software still seems to be available but appears to be no longer developed. On Stage Lighting readers always want to know how they can learn this kind of technology without huge budgets. Do you have experience of any other free/cheap solutions for pixel mapping? Tell us about your experiences in the comments box. In my opinion MADRIX is the best choice for pixelmapping and live effects. The system is easy to use and the Windows-based graphical user interface (GUI) allows you to generate a multitude of simple yet creative effects for your LED application in no time at all. Awesome Sound2Light and Music2Light effects are inluded. Hi Chris, Madrix has been recommended to me before but I have yet to try it. Thanks for visiting. For anyone who want te get some experience with pixelmapping without the big money spent on many lighting devices. The JB Systems Matrix Led has 256 leds, which can be controlled seperately. It doesn’t produce an immense lot of light and hasn’t changeable colours. On the other hand it is quite cool to get started and to show some simple images or text, all for under €250. is it : connect the the board (avolite tiger touch) , opto splitter, and laptop (pixelmapper) into a network Hub. Thanks for sharing the Madrix tip Chris. Looking forward to looking into that. Hi there,I read your blogs named “Pixel Mapping Stage Lighting Guide – Stage Lighting Online Tutorials, Information and How To” regularly.Your story-telling style is awesome, keep doing what you’re doing! And you can look our website about love spell.